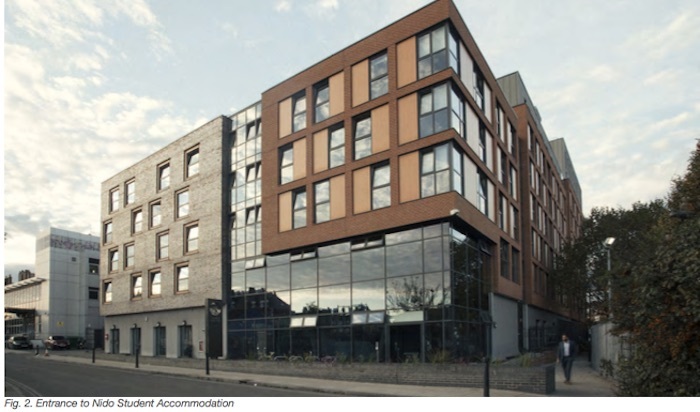 The new owner of the student housing block on Blackburn Road, has put in a planning application to add 41 additional rooms (studios) to the block buy adding extra floors on top. 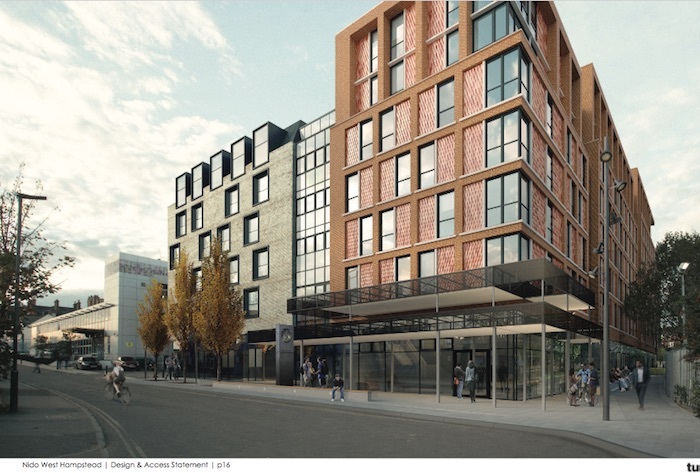 The development already has 347 units and has already been given planning permission to add an extension to the internal courtyard and a new outdoor canopy to the front. The new application is to add extra floors to the existing building(s). Each of the constituent blocks will get additional floors. The one facing Blackburn Road will get a single storey mansard roof, the one on the corner will get a two-storey extension, the one in the middle will get one floor and the tallest will stay the same height but will have its lead roofing replaced by brick fascia to match the others. Blackburn Road student housing ‘after’. 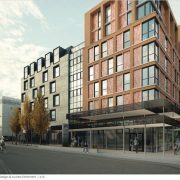 From an aesthetic point of view, the new design seems to bring the building more in keeping with West Hampstead Square. 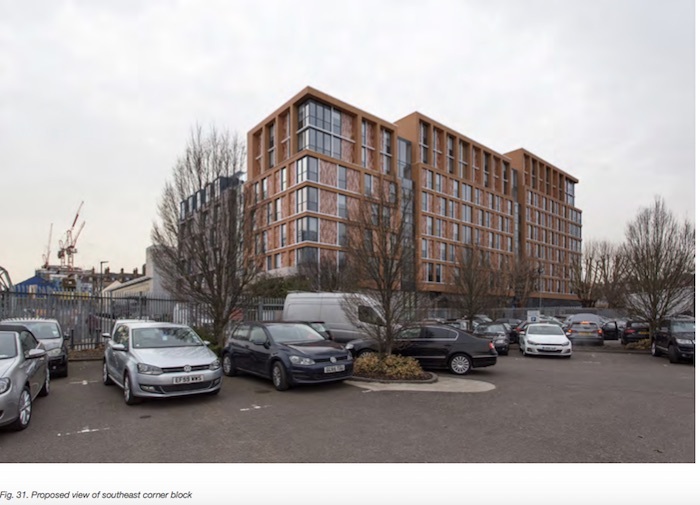 Unusually, the planning application explicitly criticises the ‘ugly’ lead roof – the “top single storey and a 2-storey zinc appear just dropped on the roof”. Clearly Camden didn’t feel it was too ugly first time around. One can argue the visual merits of mixed materials vs. homogeneity. Proposal as seen from the O2 carpark. 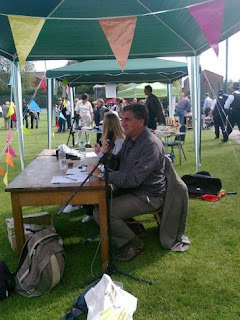 The developers have presented the plans to the NDF (Neighbourhood Development Forum). The NDF is quite relaxed about the extra storeys and indeed at their public meeting someone opined that the existing building was of’incredibly poor design’. Apparently, the council feels the same way as ‘the council continue to recognise the opportunity to improve the appearance of the existing building’. The extra height will cast shadow on what could be the best location for a green space as and when the O2 car park is redeveloped, so decisions made now could influence future plans – more evidence for the need for some joined-up thinking/masterplanning. The NDF did say that as a quid-pro-quo for development it would like to see improved landscaping at ground level. The developers have made some sensible suggestions. However, when the scheme was originally built there were improvements to the passage at the side of the building. Sadly these improvements were not maintained and the area soon looked unkempt again. If there is no maintenance plan for the new planting, the same thing will happen again. Agreements to landscape need to come with a commitment or obligation to keep any new landscapes areas in good condition, or funding so the council can do it. New landscaping plans, but who will maintain it? 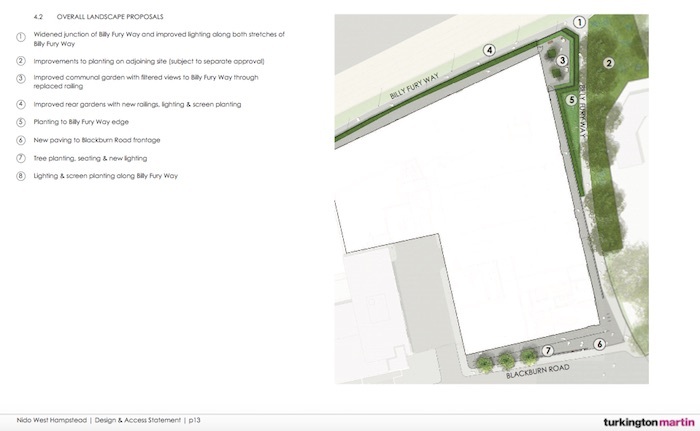 The developers are also proposing improvements to the end section of Billy Fury Way (from West End Lane to the corner of the building). Billy Fury Way has been a problem now for some time that the council and Network Rail seem unable to resolve. No progress is being made, nor are any of the options being costed or considered on a value-for-money basis, which is surprising in an era of budget constraints. The original landscaping in front of the building is also to be replaced having not been successful (or maintained). Planting Birches (a woodland tree) in a baking hot pavement was done by someone who didn’t know what they were doing. Despite concerns about the impact on the area, the students don’t seem to cause anti-social behaviour (their parents are paying over £10,000 p.a. per room). Also, although it took a while, all the commercial space is now let, so overall it’s a benefit to the area. It’s just a bit odd that it is being redeveloped so soon and partly on grounds of poor design. You can add comments on the application up to the 23 January.